It’s been hard without internet – actually it’s been great- but hard to keep updating. We’ve had a great trek and are now on our way back to Kathmandu. Keep up to date on the www.everestrocks.com website for now. I’ll post more pics and vids once I get back to the Yak and Yeti Hotel. Last night I dreamt my cancer came back. In the dream I walked through the dark hostel hallways peering into different rooms until I found James (the co-founder of Love Hope Strength). I shook him awake and told him “Dude, Luke is back.” He looked at me and drowsily assured me he had my back and then mumbled something about coloring his hair. I woke up terrified and confused. I’ve had some strange dreams before, but never this particular one. I’ve thought about my cancer coming back of course, but never in my dreams has this particular possibility arisen. So why now? Maybe because on this trek, cancer is so present. It’s on everyone’s minds, it’s why we’re here, it’s responsible for all this. This cause, this trek, this music, these people – all of it has come to be because of cancer. You can’t be here and not think about the big C, so it’s natural that it might arise as a topic in one’s dreams. But it got me thinking, for some of us this trek is more than just a creative fundraiser or never ending music video. For some of us, every step is a reminder of our disease, our treatment and our recovery – whether we want to be reminded or not. So why are we here? We’re not here for the fame or the glory. The cameras aren’t on us, we’re not famous recording artists or climbers, and surely having beaten cancer we don’t have anything to prove. Yes, there is a good cause to support – one my fellow survivors on this trek understand more than anyone, but perhaps there is something more. At some point I believe, every cancer survivor makes a decision, conscious or otherwise, to move on, to let go, to say goodbye to cancer and leave behind the identity or label of “survivor” and just get on living. But letting go of cancer is hard. I know. It may in some ways even be harder than beating it. In the fight you are completely engaged with your whole being, on auto-pilot with a godly determination and belief that this thing will not beat you. Once you realize it hasn’t, things can sometimes get difficult. Who are you now? What does beating cancer really mean? How will you deal with the scars physical or emotional? Why did you make it when so many others did not? How do you know it’s really gone? Most cancer survivors don’t become famous for it. They don’t star in movies or music videos, they don’t write books, they don’t get medals or awards. Most survivors simply take the little bit of enlightenment that comes with surviving and carry on. And so here in the mountains surrounded by constant reminders of this disease it’s worth observing that we are also surrounded by much love and support – and powerful, peaceful Himalayan energy. Maybe this is a perfect place to say goodbye. It wont be easy, but with so much love, hope and strength in the air, I can’t help but try. Just when you think it cannot get any better, it does. We shouldn’t be surprised by this – it’s been true every day since we started this escapade, but still, what a day. Last night the rains came and deposited a light dusting of snow in the mountains that made the spectacular views even more majestic and the musicians provided an excellent soundtrack as always, even taking time to teach a couple of the sherpas to play a few bars. This morning we left the most amazing hostel behind; great beds, great heaters, great meals, great staff, great views…it was hard to leave – and if anyone asks, we were roughing it in tents – but leave we did on what was meant to be one of the longer trekking days. We all had a good lunch afterwards and catnapped in the sun until Ade cracked the whip and encouraged us onward and upwards towards Pangboche. The route was blessed with amazing views, not only of the mountains around us, but of the rushing river we crossed earlier in the day over a handmade wooden bridge covered with new prayer flags flapping in the cool mountain breeze. Looking down everyone was impressed with how far we’ve come in such a short time. And for the first time today the path was filled not only with infecting scent of “Eau de Yak Turd,” but also the indescribable effervescence of fresh Balsam drifting down from the conifer bows curving above our path. As usual the trip passed faster than expected despite constant Yak traffic jams, pauses to admire hand carved Mani prayer stones and of course, countless photo ops. It was another perfect day of hiking in the Himalaya and we celebrated, against Ade’s best advice, with a round of very cold, very deserved beers upon arrival. The group continues to bond and the energy and spirit of what we are doing is palpable. Up here in the Himalayas it’s hard to believe the reports from home about all the press we are getting, but when you look around at the people here it starts to make sense. There is so much talent, so much dedication and and so much love up here. It takes a special kind of person to do something (crazy) like this and more and more I’m realizing how lucky I am to have snuck in to spend quality time with them all. We are all here, doing well and rocking out. The trekking has been amazing and the impromptu acoustic sets have been great too. Internet here is not ideal, but it’s amazing they even have it all when you consider where we are. Hope to post some pics soon if I can hop on one of the production laptops. In the meantime, check out the Everest Rocks website (link to left) to see latest reports from the hill, send us messages and watch podcasts. Oh, and Yaks are way cool. I’m adding them to the list of animals I’d like to have on my farm one day – which so far includes; Donkeys, Kookaburas, Goats, a dog, and now, of course, Yaks! 2) So far they haven’t put one on Mt. Everest. This is how it should be, but it does mean that as much as I’d like to, it may be difficult to keep you all abreast of the situation up there. Who would you rather fly with? 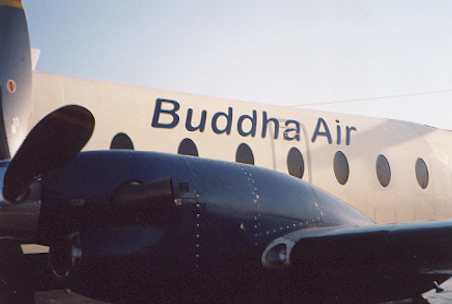 We depart tomorrow morning at 4am to fly to Lukla and from there we’ll have a 7 hour hike ahead of us. We won’t return to Kathmandu until the 27th. So it’s quite possible I’ll have to post all the great pics and stories from the trek then. Until then you can follow along on the Everest Rocks website (link at right) and if I can hop on their equipment while we’re en route, I’ll share tall tales from the trail. Thanks again everyone for all your support and good wishes. It’s going to be great. You are one of the luckiest people in the world, to live where you live, to eat how you eat, to work how you work and to be cared for how you are cared for if and when you go into a hospital. Today James and Greg and I went to visit the Kanti Hospital to visit the children’s cancer ward. What passes for an acceptable level of hygiene, sterility, cleanliness is outrageous. I could easily horrfiy you with images of struggling children and the repulsive conditions in which they recieve their treatment, but I’ll just share this one. This is James scrubbing up in the same sink where Doctors and Nurses wash up before surgery and treating patients. When you are done you dry your hands on a towel you wouldn’t use to wash your dog with. Needless to say the funds raised by Everest Rocks will be put to good use here in Nepal. And the good news is at least the Doctor is really good. I’ve spoken with more than my fair share of cancer Docs and this guy knew what he was talkikng about and was doing the best he could given his situation. Our intention was to speak to some of the many parents who often choose not to spend the money to make their children well becuase it’s too exensive and they have other kids to support anyway. We wanted to say “look at us, we had cancer too and we beat it. So can your kid – get them the treatment,” but in the end we simply held back the tears and gave away stickers and plastic toys. And in this environment, you can imagine what joy this brought to the young ones. Modern medicine typically comes in two common forms: pills and liquids. I’d like to suggest a third: tubes. It’s all about familiarity and predictability – two things you almost never have, or want when you are traveling. Except when you are homesick. For many travelers, myself included, that instantly recognizable cardboard tube with the mustachioed man on it calls out like a friend from home – wherever home may be. Sometimes it doesn’t pay to be brave. Sure you saved up your money to experience a new country, new cultures, new foods, but sometimes…sometimes you gotta check yourself. My advice, Save toilet paper, grab yourself a tube of Sour Cream and Onion and eat those instead. And if you really, really gotta try that mystery street vendor meat, do it on the last day of your trip. Ok so you had too many local beers and went back to Mr. Mystery Meat vendor. Well, whatever is going on in your tummy, a massive influx of masticated Pringles will sort it out. It’s like cement, they go in and everything just hardens up. Take that Montezuma! As much of a disgrace as bicycle racing has become there’s one thing Tour de France riders can’t get punished for loading up on; Carbs. The fact is they give you energy. So if you’ve been sleeping on train station benches or just feeling slack, load up. And here’s more good news. You don’t need a prescription for Pringles. Unlike most medicine there’s no need to read the label, in fact, you probably can’t even if you wanted to. Half the time the labels are in a language completely different to the one spoken where you bought them. You don’t have to take them as directed (but how else would you? ), you probably can’t overdose, (maybe), and best of all, a tube of Pringles never expires, at least not in your lifetime. The best thing is, you don’t even have to pack a bulky tube in your first-aid kit. 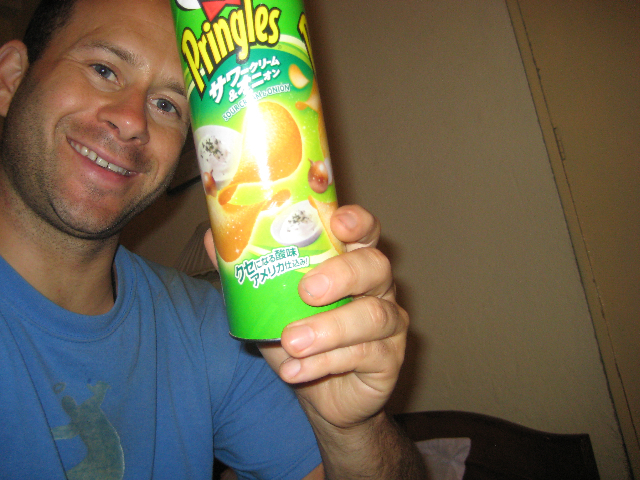 Pringles can be found anywhere on the planet. I’ve traveled in over 40 countries and I can tell with you with absolute certainty that Pringles are everywhere. Maybe not every flavor, sometimes flavors you never heard of before, but they are everywhere. I’ve been places where you couldn’t find a Coke or a Big Mac to save your life, but easily spotted Mr. Pringle chilling on a dusty shelf inside a rundown shack made of straw and cow patties, the local equivalent of a 7-11. Pringles are great not because they are delicious, but because they are familiar – and they work. I know it’s reconstituted potato paste and a bunch of chemical flavoring, and I don’t care. Each time you slide a perfectly formed chip into your mouth, Pringles delivers.